Whether you want to educate customers, drive more conversions or nurture new leads, landing pages can help you do just that. However, a landing page needs to meet certain criteria if you want it to be an effective marketing tool. Even though landing pages can form part of a website, they are designed to achieve a specific goal such as growing an email list or increasing profits instead of simply providing visitors with general information. Each landing page should be geared towards a particular goal so that you’re able to provide visitors with a clear call to action. It’s important to note, however, that there’s no exact landing page formula that everyone should follow if they want to see the highest conversion rates possible. There are some best practices that you can follow but testing is key if you want to find a formula that works for your brand and your specific target audience. This particular landing page is quite common because it works so well. This is because it gives visitors a good overview of what the product is, how it works, and the problem it solves. Since product landing pages are also highly visual, they give visitors a good idea of what the product looks like too. Additional features such as FAQs, testimonials, and social proof help increase conversion rates. The main aim of an opt-in landing page is to get visitors to hand over some basic contact details in exchange for a newsletter, ebook, white paper or any other type of downloadable content. Opt-in landing pages work well because they get to the point and are impactful. Eye-catching visuals, compelling copy, and a short form with minimal fields is all that’s required to create an effective opt-in landing page. Long sales landing pages are the original landing page and are still used by a number of today’s companies. Most sales landing pages contain between 800 and 1,000 words with the aim of providing visitors with as much information as possible. Contrary to popular belief, long sales landing pages convert really well, especially since they’re targeted at visitors in the final stages of the buyer’s journey. When done right, landing pages with generous amounts of copy work really well as it draws the visitor in by telling a story. Effective sales landing pages use copy to keep emphasising the value of their offering. As the name suggests, video landing pages are all about the videos. Most video pages will use a solid background and remove any play and pause buttons so that visitors can completely focus on the video. The page will also include a prominent call to action, telling visitors exactly what next step to take. Some video landing pages will only contain a video that once watched till the end, will direct visitors to a conversion page. The reason why video landing pages tend to have high conversion rates is because they’re highly engaging and appeal to online users’ low concentration levels. This particular type of landing page is also minimalistic, which ensures that visitors don’t feel overwhelmed and are only receiving the most pertinent information. 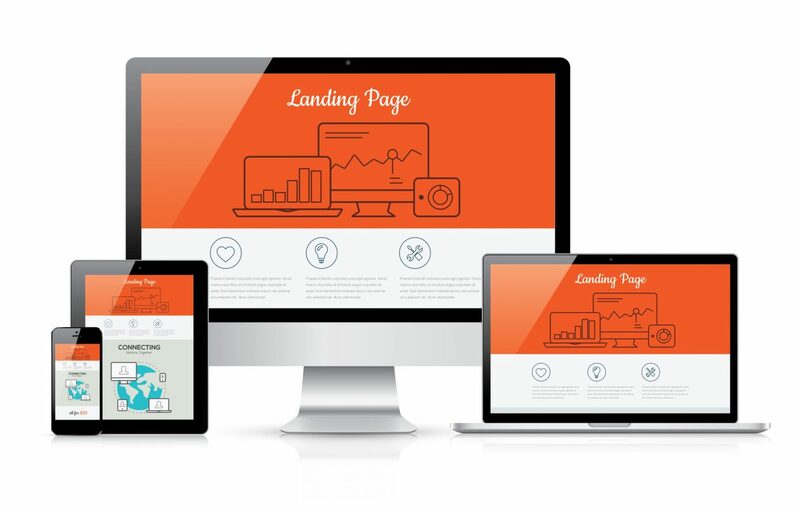 If you’re in the process of developing a landing page or are looking for ways to improve your current landing page, here are a few tips from CoolCat Digital that will help you take your landing pages to a whole new level. Your headline is the first thing that your visitors are going to see, which is why it’s important to make it as compelling and eye-catching as possible. The headline of your landing page should be as brief as possible and describe what your product or service is all about. If possible, use an image that compliments your headline so that there’s no need to go into too much detail. Keep your target audience as well as their needs and pain points in mind when developing the headline for your landing page. More often than not, your images will do more of the selling than your copy will so use high-quality, unique images that accurately reflect your product, service or offering. If you want to create an effective landing page, it’s best to stay away from standard stock images as they may just end up detracting from your page instead of enhancing it. If you would prefer to make use of stock images, get a designer to help you make them more unique to your brand. Social proof can be the one thing that tips the conversion scales in your favor, especially considering most online users place such a high value on referrals from friends, family, and people they trust. If you have them, add customer testimonials to your landing page as an extra way to show visitors that your company, products, and services can be trusted. An added bonus is if you can include photos of your customers to make the testimonials more personal and relatable. As you design or even redesign your landing page, make sure the elements flow in a logical order. Start by drawing your visitors in with a great headline and eye-catching visuals before you delve into benefits of your offering. From there, throw in your customer testimonials to put the cherry on top. End the page with a strong and clear call to action. If your landing page is long enough though, you could include multiple calls to action throughout your copy. Add some movement to your page by mixing up the layout and the placement of your copy, sub-headlines, and images. The length and content of your page is really dependent on the type of landing page you’ve decided to use as well as what your goals and objectives are. Your visitors don’t want to know who you are or what you specialize in. They want to know what you can do for them. When creating your landing page copy, focus on how you will add value to the lives of your visitors. What are the benefits and features of your product or offering and how will it help someone solve a particular problem or address a pain point? If visitors really want additional information on your company, they will look for it on the other pages of your website. In order to build even more trust, make it easy for visitors to contact you by including a contact number, email address as well as links to your social media accounts. If your landing page does form part of your core website, you will more than likely already have all your contact details, including your address, in the footer of your site. Basically, it’s important to show visitors that your company is real. In the same way that you would test your email and social media campaigns, it’s important to test your landing pages too. Any sales touch point should always be tested to find a combination that leads to the highest number of conversions. Carefully select the page you want to test. Make sure that the landing pages you’re testing will have an impact on your business. For example, pages that request demos, ask a visitor to sign up for a newsletter or book a consultation will impact your business and will give you something to measure. Don’t choose a winner too soon. To make sure that your test results are statistically significant, it’s important to not choose a winning landing page too soon. Wait for a significant number of conversions to take place before you decide on a winner. Only test one thing at a time. To produce accurate results, it’s important to only test one element at a time otherwise it becomes impossible to determine what increased or decreased your conversion rate. Don’t forget about quality. While a landing page may be achieving high conversion rates, what are the quality of the leads like? If your winning landing page isn’t producing qualified leads, it shouldn’t be your winning option. Page headline. Since this is one of the first things that your visitors will see, it only makes sense that it should be one of the first elements that you test. You can change up the wording, sentence structure or even add in numbers or symbols to create different headlines. Value proposition. This is the copy that explains how visitors will benefit from converting. Not only can you vary the copy but you change up the length and layout by adding in elements like bullet points. Testing out this copy will give you a good idea of what really resonates with your target audience. Call to action. CTAs such as Download or Submit don’t quite produce the same results as using something more specific such as Download Your Marketing Ebook Now. You can also test between buttons and links to find out what works better. Forms. Generally, visitors aren’t fans of handing over too much information right up front, which is why it’s useful to test out your forms in terms of the number and types of fields. Don’t forget to also only test one field at a time. Images vs. videos. Testing out images versus videos could completely alter your conversion rates and give you further insights into what appeals to your target audience. If you do find that videos provide better results, you can take these learnings into your brand’s content strategy too. Testing your landing pages does require some additional time and effort but once you see the effects that it has on your conversion rates and sales, it will quickly become an integral part of your marketing efforts.